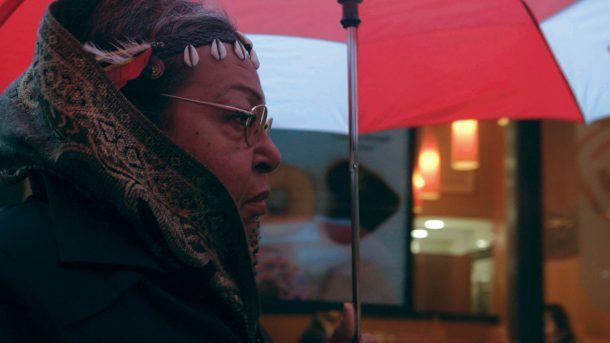 The most telling moment of the recently released Netflix documentary The Death And Life Of Marsha P. Johnson, directed by How To Survive A Plague’s David France, doesn’t actually feature Marsha P. Johnson herself. 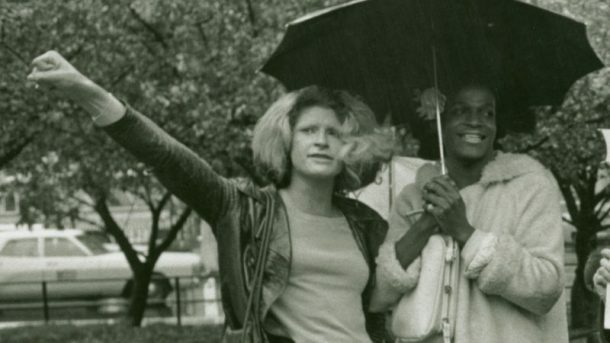 Midway through the documentary film, which focuses on the suspicious death of the activist, Stonewall veteran and “Rosa Parks of the LGBT movement,” France drops in footage of Sylvia Rivera, Johnson’s close friend and Street Transvestite Action Revolutionaries (S.T.A.R.) co-founder, as she rushes the 1973 Pride March stage to nauseating boos from the crowd. The clip is a chilling reminder of how white cis people, even within the LGBT community, have historically and currently pushed trans people and the violence they experience to the side as inconvenient roadblocks to their own liberation. However, perhaps the most significant–and easily missed–aspect of the clip is France’s decision to leave in the beginning when a white cis man gives Rivera the microphone with the thought, “I want us to avoid any trouble. This is a day of unity for us. I want us to be happy.” With this purposeful inclusion, a moment I haven’t seen on any YouTube or Vimeo footage, it’s…hmmm….almost as if France is integrally invested in the idea of the white cis gay man savior narrative–one that pervades the entire film and its production. And this, in part, explains the firestorm that has occurred around the documentary in the last few days. Before getting into the film itself, it feels essential to preface it with the context in which it was just released. Artist and activist Reina Gossett, who has done extensive research on Johnson, Rivera and S.T.A.R. 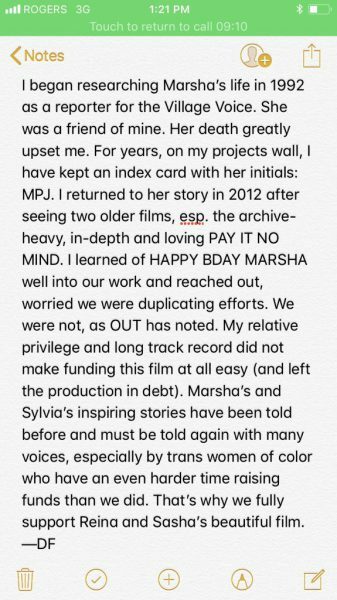 (which you can read here) and has been making her own film on Johnson entitled Happy Birthday, Marsha! with Sasha Wortzel, took to Instagram to explain how France stole her intellectual labor for the film. She describes her dismay at seeing the multi-million dollar Netflix release–done with her research–while she is struggling to pay her rent. Nothing says, “I’m taking this seriously.” like a note written on your iPhone mid-call. Continuing to defend himself, pointing to his attempted support of Happy Birthday, Marsha!, France seemed particularly convinced that HE was the person to make this film. He went on to assert on Twitter that he felt “obligated to use my voice for her legacy. The opposite is neglect.” Rather than overpowering the voices of a community you are arguing is marginalized, why not use that privilege to, oh I don’t know, prioritize and center those voices? It is unclear just who France means by “no one else” considering in his defense yesterday he named both Happy Birthday, Marsha! and the 2012 documentary Pay It No Mind. By the time the films opens, Marsha is already dead (as well as dead-named in the first two minutes, as Ted Kerr insightfully pointed out to me on Facebook). The narrative of the film is largely driven by the care and charisma of longtime activist Victoria Cruz who works at the New York City Anti-Violence Project and embarks on her own personally driven mission to seek justice for Johnson. Cruz, a trans woman who is no stranger to violence herself (she reveals in the film that she was sexually and physically abused at her prior job at the Cobble Hill Health Center, which led her to seek the aid of the Anti-Violence Project), emerges as both the film’s heart and witness. She travels around the Tri-state area to meet with Johnson’s family and friends and frustratingly gets stonewalled by the NYPD, who seem largely uninterested or unwilling to help. And yet, after watching the documentary, certain details and omissions kept nagging at me. The Death and Life of Marsha P. Johnson, with its near constant overly dramatic strings music, is framed more like a true crime documentary similar to Netflix’s other popular serial documentaries like Making A Murderer and The Keepers. Now, I adore true crime as much as any lover of trash, but in telling the story of Marsha P. Johnson, an important figure to the LGBTQ community who many casual Netflix viewers may not know, it seemed in poor taste. Perhaps because of these stylistic choices, The Death And Life of Marsha P. Johnson appeared entirely more invested in Johnson’s death than in her life and accomplishments beyond her participation in the Stonewall Riots and S.T.A.R. Johnson’s story is, in part, told through disparate archival footage of the activist and interviews with some of her friends and activist colleagues. Naturally, the best parts of the film are the clips of Johnson who is infectiously vibrant. For example, asked by a reporter at a march, “How do you think this will affect your job?” Johnson exclaims, “Darling, I don’t have a job! I’m on welfare! I have no intention of getting a job as long as this country discriminates against homosexuals.” You can’t help but smile. Like the 2012 documentary Pay It No Mind, which, according to his Twitter defense, inspired France, the film also heavily relies on interviews with her friends and colleagues to tell her story. In fact, the list of interviewees seems as if it was cribbed directly from Pay It No Mind, with overlapping appearances by Randy Wicker, Agosto Machado and even, Taylor Mead, who emerges posthumously in black-and-white footage to yell, “Marsha Johnson is our queen forever!” Most of the interviewees are cis; many are white men. Rather than mirror the lineup of a former documentary, why didn’t France seek out more a more diverse group of people to speak about their experiences with Johnson? 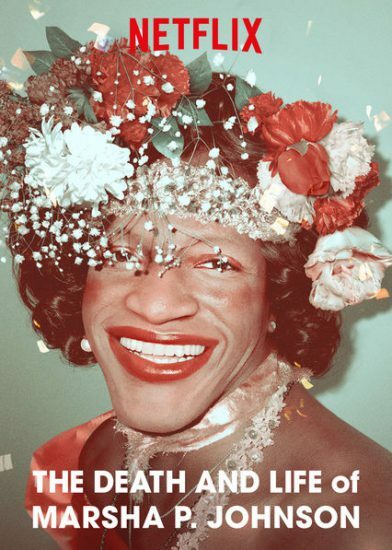 Even though one of the interviewees in The Life And Death Of Marsha P. Johnson implores viewers to not mistake Johnson’s flippant and often campy delivery for “lack of serious purpose and political intent,” viewers are barely able to gauge her political intent for the footage of Johnson is given little to no context. It might be fine for viewers that already have a base of knowledge about Johnson, but what if they don’t’? Take, for example, the numerous clips of Johnson singing with the drag performance troupe Hot Peaches. Before the archival footage, we see Cruz sitting with Johnson’s brother and sister, asking them to sign a letter in an attempt to receive the Medical Examiner’s report on Johnson’s autopsy. Her family jokes that Marsha could do anything but sing. Cue a string of clips of Johnson caterwauling her way through a song with absolutely no context. Without my own knowledge that these were performances with Hot Peaches, I’d have absolutely no clue what I was watching. This is only one example of the poorly contextualized pieces of Johnson’s life. In some cases, this lack of context looks an awful lot like willful omission. In particular, the film glosses over Johnson’s AIDS activism, mentioning briefly that Marsha cared for people with AIDS, omitting that she was a part of ACT UP and was HIV-positive herself, as she reveals in Pay It No Mind. Both of these are interesting facts to overlook considering France’s previous film How To Survive A Plague focused on AIDS activism and was criticized for its almost singular focus on white cis gay men. Last but not least, France also bizarrely fails to mention the reopening of the investigation into Johnson’s death in 2012. Even before Victoria Cruz’s personal investigation, trans activist Mariah Lopez pressured the NYPD to reopen the case, which they did. At one point, Cruz speaks to a cold case detective who mentions a more recent investigation, but why gloss over the fact that this investigation occurred because of pressure from the trans community? Wouldn’t it be important for viewers to see that trans women of color have continually fought to get justice for Marsha? Taking all of these omissions and lack of contextualization together–not to mention Gossett’s experiences, The Death And Life Of Marsha P. Johnson ends up proving its point–trans people of color continue to get shoved out and written out of LGBTQ history. Ironic, yet, anything but surprising. Tags: David France, Happy Birthday Marsha!, How To Survive A Plague, Mark Blane, Marsha P. Johnson, Netflix, New York City Anti-Violence Project, Pay It No Mind, Reina Gossett, S.T.A.R, Sasha Wortzel, Street Transvestite Action Revolutionaries, Sylvia Rivera, The Death And Life Of Marsha P. Johnson, Victoria Cruz. Bookmark the permalink.